NETWORK FINALS: THE ORIGINALS gained 0.1 in final numbers. 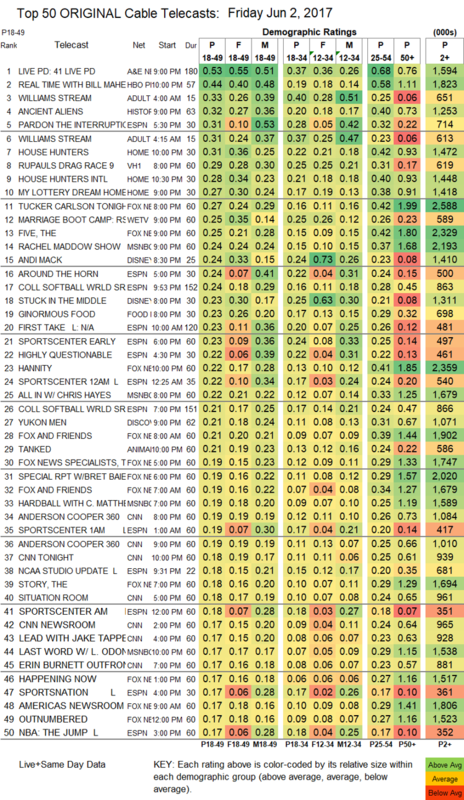 CABLE HIGHLIGHTS: A&E’s LIVE PD went back to listing its ratings with a single 3-hour number, and it led Friday cable at 0.53, compared to last week’s 0.30/0.29/0.28/0.24. HBO’s REAL TIME WITH BILL MAHER returned from a week off down 0.08 to 0.44, although next week’s ratings will be more interesting after the storm that Friday’s episode caused. 2 segments of Adult Swim’s 15-minute WILLIAMS STREAM, beginning at 4AM, were at 0.33/0.31. History’s ANCIENT ALIENS rose 0.03 to 0.32. HGTV had a trio of shows in the Top 10, with HOUSE HUNTERS at 0.31, HOUSE HUNTERS INTL at 0.28, and MY LOTTERY DREAM HOUSE at 0.27. VH1’s RUPAUL’S DRAG RACE lost 0.06 to 0.29. Fox News led the night’s news shows at 0.27/2.6M for TUCKER CARLSON TONIGHT, with MSNBC’s THE RACHEL MADDOW SHOW at 0.24/2.2M. We’s MARRIAGE BOOT CAMP came back after a preemption up 0.08 to 0.25. ESPN’s COLLEGE SOFTBALL WORLD SERIES coverage was at 0.24. 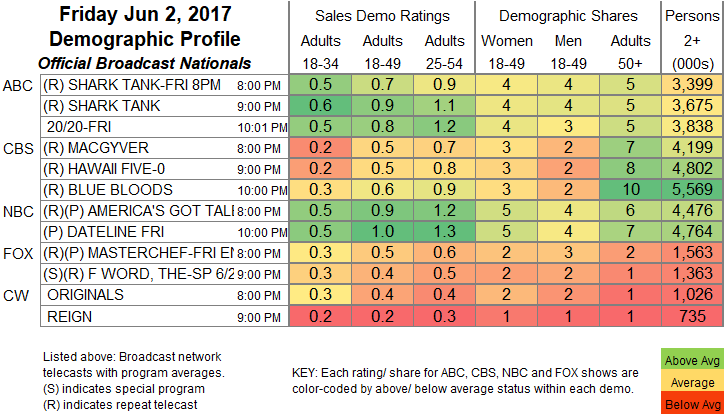 Food Network’s GINORMOUS FOOD gained 0.04 to 0.23. Discovery’s YUKON MEN climbed 0.03 to 0.21.